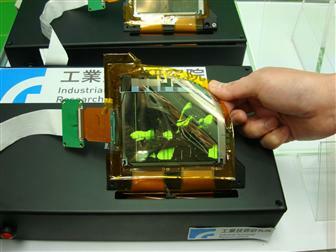 Taiwan's Industrial Technology Research Institute (ITRI) is showing several new flexible display prototypes - AMOLEDs, roll-to-roll cholesterol liquid crystal displays and electrowetting displays. ITRI's AMOLED is a 4.1" panel, made on plastic substrate. The prototype is monochrome, but it can be made with color materials.